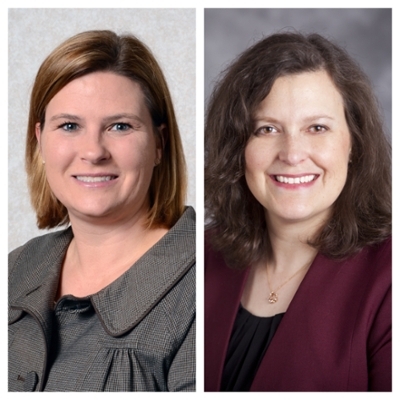 As part of its new cancer service line, Winship Cancer Institute of Emory University and Emory Healthcare have made two important appointments: Melissa Childress, MBA is the new vice president of cancer services and Kim M. Slusser, MSN, RN, CHPN is the new vice president of cancer nursing. The Winship cancer service line will facilitate the further development of a culture of excellence in quality and service across all inter-professional cancer care teams. Childress is responsible for helping to drive coordinated cancer services along with hospital and clinic leadership across multiple hospitals within Emory Healthcare with the goal to have a Winship clinical care model that is consistent and seamless, as well as patient and family-focused, and research driven for all types of cancer across all locations. Slusser is responsible for development and oversight of Winship oncology nursing practice guidelines across Emory Healthcare to enhance the continuum of care and lead the ambulatory clinical care teams for the Emory system. She is responsible for leading clinical quality, safety, outcomes, education and oncology nursing research. "Both Kim and Melissa were identified in national search efforts over the past year," says Winship Executive Director Walter J. Curran, Jr., MD, "Both are extraordinary leaders with the necessary experience to lead Winship cancer care delivery to a new level of excellence." "We are excited to welcome Kim and Melissa and their passion for excellent cancer care to our Winship / Emory Healthcare Leadership Team," says Dane C. Peterson, Emory Healthcare Hospital Group President. "In addition to their passion, they also bring unique skill sets, honed by many years of experience, that will improve the lives of our patients and families." Childress has served as associate executive director for business development at the Ohio State University Comprehensive Cancer Center and James Cancer Hospital in Columbus, Ohio. During her tenure at Ohio State, Childress played a key role in launching the James Cancer Network and creating the global medicine office that facilitated patients from more than two-dozen foreign countries. She was also responsible for overseeing faculty recruitment activities for the cancer program. Since 2008, Slusser has worked at Duke University Hospital in Durham, North Carolina. In her most recent role as clinical operations director, she was responsible for leading the adult oncology clinical areas that include inpatient units as well as infusion centers. Previously, Slusser worked at Northwestern Memorial Hospital in Chicago, Illinois, serving in various roles including manager of an oncology and palliative care unit and clinical coordinator. She has also held nursing positions at Hospice of Dayton in Dayton, Ohio, and Stouder Memorial Hospital in Troy, Ohio.